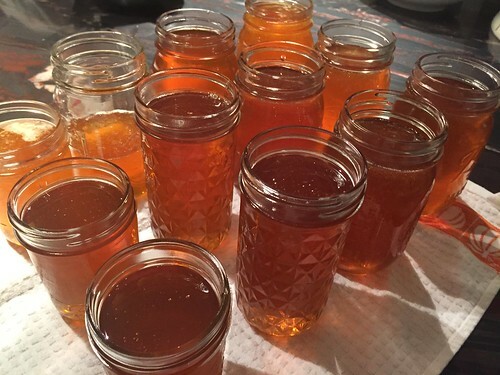 Yesterday I bottled 10 pints, 15 lbs, of honey for us to eat. It's spicy and sweet, medium amber. Really good. I think better than my September batch of honey, which was collected in a super and probably all Pepperbush honey. Pepperbush, a white flowered shrub, was in full bloom around the pond in August and September. It gives a floral, very mild honey. I took this new honey from frames throughout the hive, so it's a mix of flower nectars collected throughout the season. Beautybush, Silverbell, Black locust, apple, Ajuga, clovers, purple loose strife, and fall asters and goldenrods. Greg wrote to me Monday to say he was sorry I lost a hive. He said, "I've been told this is the riskiest part of the winter because brood is expanding and the overall population may still be declining. That means there is more brood to protect and keep warm during very cold spells." 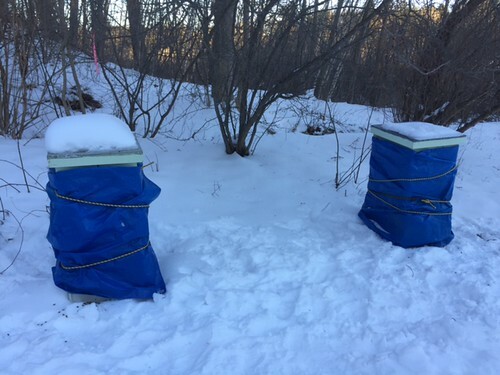 Greg also mentioned the tarps I put on my hives during the recent cold snap, saying that moisture in an airtight hive can be more deadly to bees than cold. Well, I was very sad to see my hive go. I wrote back to Greg that I think the hive was dead before I wrapped it as there was a large pile of dead bees on the ground that day. I think, as he said, they didn't have enough bees to keep brood or adults warm. 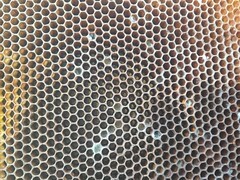 I think the hive probably died soon after I moved it. It was in a cold, damp location. 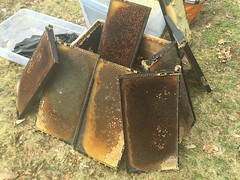 I think the number of bees declined in the fall because there was too much honey and no room for brood in the top box where the bees were located. I probably should have moved frames around to give them room for brood at the top of the hive. 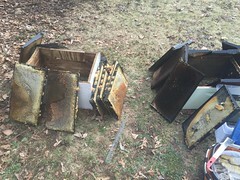 Sunday I took the tarp off, opened the dead hive and took it apart. 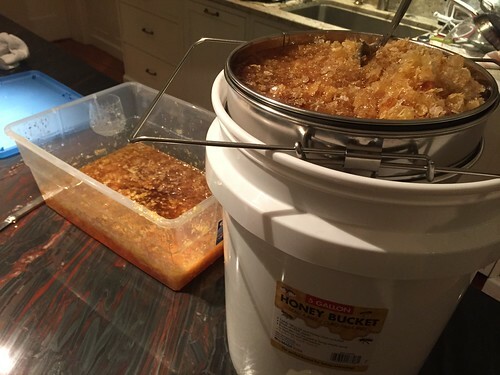 I took out about 50 lbs of honey. I'll save most for my new package coming mid-April and I have about 20 lbs for myself. I scraped off the best sections of honey. It's in a container now waiting for a sieve and bucket I ordered. It's really nice spicy honey. I took a lot of photos as I dismantled the hive. Sad to see the dead bees. - The marked queen was there with many other bees around her. - There was a lot of capped and uncapped honey. - A number of dead adult bees were nose down in cells. 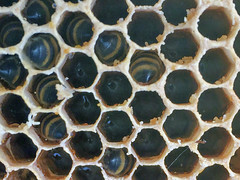 - There was dead brood emerging and about to emerge though no younger brood. - There was mold and moisture in the lower box. - I found one Varroa mite on the abdomen of a dead bee. It's the first mite I've seen after looking at thousands of my bees on photos, so I don't think mites killed the hive. 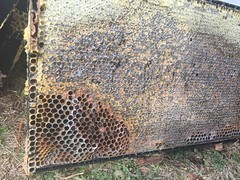 About the mold, I think it grew when the tarp restricted airflow in the dead hive for the past week and maybe it had been building up at the previous location when bees were alive but had low activity. 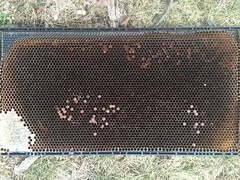 I read at Honey Bee Suite that mold happens in bee boxes in winter when they're not as active and the bee will clean it up as they expand (two good posts: moldy combs and mold during winter. 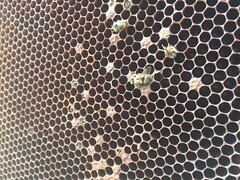 If they were dead 2 weeks before I opened the hive, I imagine mold would grow in that time. I don't think there was any foulbrood, I hope not. It didn't smell bad at all. I think the white mold in some cells was on pollen grains, not larvae. So I'm planning to save the frames for feeding bees. I hope my other other hive didn't get as much mold. It is very active now. 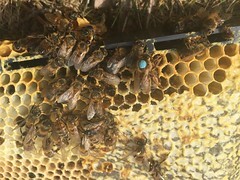 I took their tarp off that hive on Sunday too. 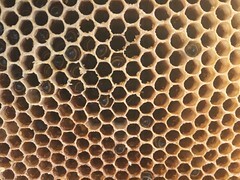 On the next warm day I would like to do a hive check and see if the frames of this hive need to be rearranged to give them room for brood. I can tell by it's weight that it's also very full of honey. It's been 3 weeks since I checked my hives and moved them. The weak hive is dead. No live bees, though lots of honey. The top box seems like about 50 lbs. My stronger hive is doing well. Maybe even more bees than last check. At least similar numbers. I checked it without gloves, face netting, or hive tools, so I didn't look too long. I'm glad they survived our brutally cold (-12 F) and windy (gusts to 30 mph) night. 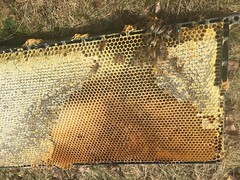 I will work on wrapping up and securing the honey-filled frames from the dead hive. I plan to use these to feed my bees this spring. I have a package coming mid-April. I want to see if I can get them going without feeding sugar water. I left the tarp on the hives for now. I think I'll leave it a couple more weeks until the weather is warmer and more settled. I suspect my weak hive died from too much damp drafty air coming off the pond and from being in a location with no winter afternoon sun. So now my live hive has both draft protection and afternoon sun. I wasn't planning to wrap my bee hives. At my bee club people usually just add insulation to the top, which I did back in November. But this is way colder than we're used to! Predictions for tonight are 5 to 15 below 0 F (-20 to -26 C) with a gusty wind to 35 mph. So I wrapped both hives in a tarp. At least this will cut down any drafts getting in the openings. As I was wrapping them, I noticed a big pile dead bees next to my weaker hive. Not so good. There were some by the stronger hives, but nowhere near as many. I went ahead and placed my order for a package of bees for mid-April from Rick at NEBees. He brings three truckloads of nucs and packages up from Georgia in April. His first truckload in early April is already sold out. I'm glad I've got mine ordered now. If, by any chance there are still bees in the weak hive, or either hive, I can combine them I suppose.